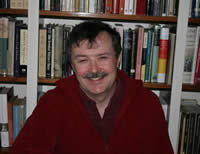 Brian Bartlett is a poet, prose writer, editor and English professor originally from St. Stephen, New Brunswick. He is the author of six collections of poetry and five chapbooks, and has edited four books, including a compilation of critical works about Don McKay, as well as selected volumes of poetry by Don Domanski, James Reaney, and Robert Gibbs. His collection Wanting the Day: Selected Poems was awarded the 2004 Atlantic Poetry Prize; his more recent collection, The Watchmaker's Table, was honoured with the 2009 Acorn-Plantos Award for People's Poetry. Bartlett earned his Bachelor of Arts degree from the University of New Brunswick, his Master's from Concordia University, and his PhD from Universite de Montreal. He taught part-time at Concordia for several years before moving to Halifax in 1990 to teach Creating Writing and English at St. Mary's University. He currently resides in Halifax with his wife, Karen Dahl, and their two children. Biographical notes written by Cassandra Inch, courtesy of the New Brunswick Literary Encyclopedia. Published in The Watchmaker’s Table. Goose Lane Editions, 2008. In his poem “West End, Halifax,” Brain Bartlett offers a series of haiku that paint short but vivid vignettes of Halifax’s West End. Though each piece is incredibly short – the length of a single haiku—they all produce a strong visual image. The strong sensory images these brief fragments create reflect the suggestion Aislinn Hunter makes in her essay “The Truth Goes On Solving Nothing - A Conceit.” Coupling the modern philosophical notion that the world is “fragmentary and unknowable” and the research of neuroscience that suggests memory is influenced by the region of the brain that allows for inaccuracy in order to make sense, Hunter explores the notion of physical reality and where, on a cognitive level, poetry exists (55). Poetry has the power to create striking and lasting images. Bartlett’s “West End, Halifax,” with its succinct but detailed sketches, exemplifies this power. For Hunter, one of Seamus Heaney’s poems creates a similar effect: “My question with this poem has always been: why do I believe it? Why when I reread it again and again do I see the same church pews and stained glass, . . . , even though these things are not in the poems? Why, and how, have I constructed a visual memory out of something that, to the best of my knowledge, I have never seen?” (57). And how is it possible that Bartlett creates such vivid images in “West End, Halifax,” that even a reader who is unfamiliar with the area is continually reminded of its image through Bartlett’s stark vignettes? Using only a few words, these haiku create an articulate and intense world that, according to philosophy and neuroscience, cannot possibly be accurate. In thirteen words, Bartlett articulates the life of a literate mushroom, and with each reading the same senses are invoked – the smell the damp walls, the muted scuffling of boots on dirty carpets in this muddled, chaotic book-store. With such immense sensory imagery in such a compact space, Bartlett has successfully raided the inarticulate, creating a vivid picture of what is, essentially, a nondescript spot in an unnamed bookstore. Again, Bartlett prevents a vivid image of Halifax, forcing his audience to imagine the city’s life beneath the concrete. The separate parts of the city, like the separate haiku in the poem, are held tightly by the ancient roots of the tress that have always lined the streets, like a protective ribcage for the city, protecting and structuring. In just seventeen syllables, Bartlett conveys so much of what is inarticulate about the city through the images he creates. But the success of this final haiku comes not only in its capture of the inarticulate, but also in its encompassing of all preceding poems. Having been placed at the end, this haiku easily binds together all the moments described in “West End, Halifax” – again articulating what is largely inarticulate. Within each one of these fourteen haiku, Bartlett achieves a similar vivid image, bringing each minimal moment to life once more. Aside from this, he allows his readers to enter his world and glimpse each brief period of time that surrounds him. This idea is something Hunter believes happens when you read a poem; you enter a room that the poet has created. If one is good, or lucky enough to bring the reader to this place, it will become “transferred memory,” which is what the reader will experience each and every time they read it (60). Bartlett, Brian. "West End, Halifax." The Watchmaker's Table. Fredericton: Goose Lane Editions, 2008. 84-87. Print. Hunter, Aislinn. “The Truth Goes On Solving Nothing - A Conceit.” A Ragged Pen. Kentville, N.S. : Gaspereau Press, 2006. 55-66. Print. Bartlett, Brian. "A Cornea's Mistake." Event 46.3 (Winter 2017/2018): 50. Print. ---. "A Family, Reading." Fiddlehead. (2014): 34. Print. ---. The Afterlife of Trees. Montreal: McGill-Queen’s UP, 2002. Print. ---. Being Charlie. Vancouver: Alfred Gustav, 2009. Print. ---. Brother’s Insomnia. Fredericton: The New Brunswick Chapbooks, 1972. Print. ---. Cattail Week. Montreal: Villeneuve, 1981. Print. ---. ed. Collected Poems of Alden Nowlan. Fredericton, NB: Icehouse Poetry, 2017. Print. ---, ed. Don McKay: Essays on His Works. Toronto: Guernica, 2006. Print. ---, ed. Earthly Pages: The Poetry of Don Domanski. Waterloo: Wilfrid Laurier UP, 2007. Print. --- ed. The Essential Dorothy Roberts. Erin, ON: Porcupine's Quill, 2018. Print. ---, ed. The Essential James Reaney. Erin,ON: Porcupine’s Quill, 2009. Print. ---, ed. The Essential Robert Gibbs. Erin, ON: Porcupine's Quill, 2012. Print. ---. Finches for the Wake. Fredericton: Fiddlehead, 1971. Print. ---. "From Bon Portage Island, Fall Weekend." Interdisciplinary Studies in Literature and Environment. 20.3 (2013): 685-688. Print. ---. Granite Erratics. Victoria, BC: Ekstasis, 1997. Print. ---. “Guara, Guara!” Brick 67 (Spring 2001): 101-12. Print. ---. "Hawthornden Journal: Notes from a Writers' Retreat." The Antigonish Review 112 (Winter 1998): 147-64. Print. ---. "Local Emotion." Brick 60 (Fall 1998): 48-53. Print. ---. "The Next Collection: A Poet Between Books." Event 27.1 (Spring 1998): 7-11. Print. ---. "One Morning in Palo Verde." Event 46.3 (Winter 2017/2018): 52. Print. ---. "Three Poems." The Malahat Review 148 (Fall 2004): 66-71. Print. ---. Planet Harbor. Fredericton, NB: Goose Lane Editions, 1989. Print. ---. "Reading on Mars." Fiddlehead. (2014): 36. Print. ---. Travels of the Watch. Kentville, NS: Gaspereau, 2004. Print. ---. "Two Poems." The Fiddlehead 275 (Spring 2018): 74-86. Print. ---. Underwater Carpentry. Fredericton: Goose Lane Editions, 1993. Print. ---. Wanting the Day: Selected Poems. Fredericton: Goose Lane Editions, 2003. Print. ---. The Watchmaker’s Table. Fredericton: Goose Lane Editions, 2008. Print. ; Calstock, Cornwall, England: Peterloo Poets, 2004. ---. "Whittling Away: An Autobiographical Tribute to The Fiddlehead on its Fiftieth Anniversary." The Fiddlehead 183 (Spring 1995): 7-14. --- and Evan Jones. Ringing Here & There: A Nature Calendar. Markham: Fitzhenry & Whiteside, 2014. Print. Bartlett, Brian. “A Dog’s Nose of Receptiveness: A Calvinoesque Reading Of Don McKay.” The Antigonish Review 139 (2004): 123. WorldCat. 18 April 2012. Web. Rev. and reprinted in Don McKay: Essays on His Works, ed. Brian Bartlett. 145-66. ---. All Manner of Tackle: Living with Poetry. Windsor, ON: Palimpsest Press, 2017. Print. ---. “A Long Fall for Poetry: Reflections on Poetry in the Public Eye and the Private Realm through the Last Months of 1994, Including Responses to Greatly Exaggerated Reports of Its Death and Resurrection.” The Antigonish Review 102/103 (1995): 63-81. MLAIB. 18 April 2012. Web, print. ---. ”Back to the Basket of Small Things: Size in the Poems of M. Travis Lane.” The Antigonish Review 147(2006): 121-136. WorldCat. 18 April 2012. Web, print. ---. Branches Over Ripples: A Waterside Journal. Kentville, NS: Gaspereau Press, 2017. Print. ---. “For Sure the Kittiwake: Naming, Nature, and P.K. Page.” Canadian Literature 155 (1997): 91-111. WorldCat. 18 April 2012. Web, print. ---. “From The Basement of Fables.” Rev. of Wolf-Ladder, by Don Domanski. Fiddlehead 175 (1993): 112-127. LiteratureOnline. 18 April 2012. Web, print. ---. "From Ringing Here & There: A Nature Calendar." The New Quarterly 121 (Winter 2012): 7-14. Print. ---. “The Grass is Epic: Tim Lilburn’s Moosewood Sandhills.” Studies in Canadian Literature20.1 (1995): 29-43. MLAIB. 18 April 2012. Web, print. ---. “‘Inscrutable Workmanship’: Music and Metaphors of Music in The Prelude and The Excursion.” The Wordsworth Circle 17.3 (1986): 175-180. MLAIB. 18 April 2012. Web, print. ---. "Introduction." Red Fox, by Charles G. D. Roberts. Halifax: Formac, 2008. vii-xvi. Print. ---. "'Journey of the Poem: 'All the Train Trips.'" Approaches to Poetry: The Pre-Poem Moment. Ed. Shane Neilson. Victoria: Frog Hollow Press, 2009. 64-74. Print. ---. “‘The Land Tugging at the Sea’: Elizabeth Bishop’s Coasts and Shores.” Divisions of the Heart: Elizabeth Bishop and the Art of Memory and Place. Ed. Barry, Davies, and Sanger. Wolfville, NS: Gaspereau, 2001. Print. ---. “‘Les Nouvelles de Cousin Emmanuel’: Varieties of Salvation and Imagination in Ferron’sCotnoir.” Studies in Canadian Literature 12.2 (1987): 177-186. MLAIB. 18 April 2012. Web, print. ---. "Nights in Windsor Castle: Remembering Alden Nowlan." Pottersfield Portfolio 18.1 (Fall 1997): 48-55. Print. ---. "'O Were This Animal World Otherwise Narrated': Richard Outram's Mogul Recollected. "Richard Outram: Essays on His Works. Ed. Ingrid Ruthig. Toronto: Guernica, 2011. 105-21. Print. ---. "'Sprawl, Twiddle, and Ache': Dennis Lee Interviewed by Brian Bartlett." Where the Words Come From: Canadian Poets in Conversation. Ed. Tim Bowling. Roberts Creek, BC: Nightwood, 2002. 123-38. Print. ---. "Two Pianos Together." Introduction to Thinking and Singing: Poetry and the Practice of Philosophy. Ed. Tim Lilburn. Toronto: Cormorant, 2002. 5-15. Print. Bushell, Kevin. “The Afterlife of Trees.” Rev. of The Afterlife of Trees by Brian Bartlett. The Antigonish Review 137 (2004): 113-117. LiteratureOnline. 18 April 2012. Web, print. Callanan, Mark. “A Loneliness Which Must Be Entered.” Rev. of Wanting the Day: Selected Poems, by Brian Bartlett. Books in Canada 33.6 (2004): 32. WorldCat. 18 April 2012. Web, print. Compton, Anne. “‘A Many-Veined Leaf’: Minutiae and Multiplicity in Brian Bartlett’s Poetry.”Studies in Canadian Literature 28.2 (2002): 131-151. Literature Online. 18 April 2012. Web. Reprinted in Meetings with Maritime Poets: Interviews, by Anne Compton. Markham, ON: Fitzhenry & Whiteside, 181-201. Cook, Trevor. "Collected Poems of Alden Nowlan." Rev. of Collected Poems of Alden Nowlan, ed. by Brian Bartlett. The Dalhousie Review 98.1 (Spring 2018): 138-141. Print. Donaldson, Jeffrey. Rev. of Wanting the Day: Selected Poems. "Letters in Canada: Poetry. "University of Toronto Quarterly 74.1 (2004). Print. Harris, Maureen Scott. "Time, Space, and Canoes." Rev. of The Watchmaker's Table. The Goose 4.2 (Fall 2008). Web, print. Inch, Cassandra. “Brian Bartlett.” New Brunswick Literary Encyclopedia. St. Thomas University, 2011. Web. 18 April 2012. Kemick, Richard Kelly. "Hark, How the White Birch Quivers." Rev of Collected Poems of Alden Nowlan by Brian Bartlett. The Fiddlehead 276 (Summer 2018): 171-175. Print. Laird, Darrell. “An Artifical Paradise.” Rev. of Planet Harbor, by Brian Bartlett. Canadian Literature 128 (1991): 189-91. Print. Leckie, Ross. “Granite Erratics.” Rev. of Granite Erratics, by Brian Bartlett. The Fiddlehead193 (1997): 138. Print. MacLaine, Brent. Rev. of The Watchmaker's Table. Atlantic Books Today 59 (2008). Print. MacLeod, Alexander.“‘Having a Conversation With the Place You’re In’: Discussing the Past, Present and Future of Atlantic Canadian Poetry with Brian Bartlett, Ross Leckie, Lindsay Marshall and Anne Simpson.” Dalhousie Review 89.1 (2009): 25-37. LiteratureOnline. 18 April 2012. Web, print. McCallum, Kirstie. “Some of These Petals: A Review of Brian Bartlett’s The Watchmaker’s Table.” The Antigonish Review 156 (2009): 67-74. LiteratureOnline. 18 April 2012. Web. Myers, Barbara. Rev. of The Afterlife of Trees. Arc Poetry Magazine (Winter 2002). Print. Riegel, Christian. "Granite Erratics." Rev. of Granite Erratics, by Brian Bartlett. The Antigonish Review 124 (2000): 135. Reibetanz, Julia. "Letters in Canada: Poetry." The University of Toronto Quarterly 73. 1 (2003): 4. Print. Sinclair, Sue. "The Trace of Their Daily Lives." Rev. of The Afterlife of Trees. The Fiddlehead. Print. Van Wart, Alice. “Temporary Shelter.” Rev. of Underwater Carpentry, by Brian Bartlett. Quill & Quire 59.7 (1993): 48. Print.